Long before the advent of strawberry-flavored cocaine and the Cosmopolitan cocktail, women were enjoying other adventures in mixing fun flavors with mood-altering substances. 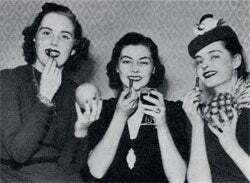 According to this news item taken from an old issue of Popular Science, the cosmetics-minded, booze-drinking women of America were painting their lips with lipcolors in flavors of Champagne and Jesus Juice. (And for those with black belts in alcoholism... rye!). Full article after the jump.